You might think I’ve completely lost it this time. 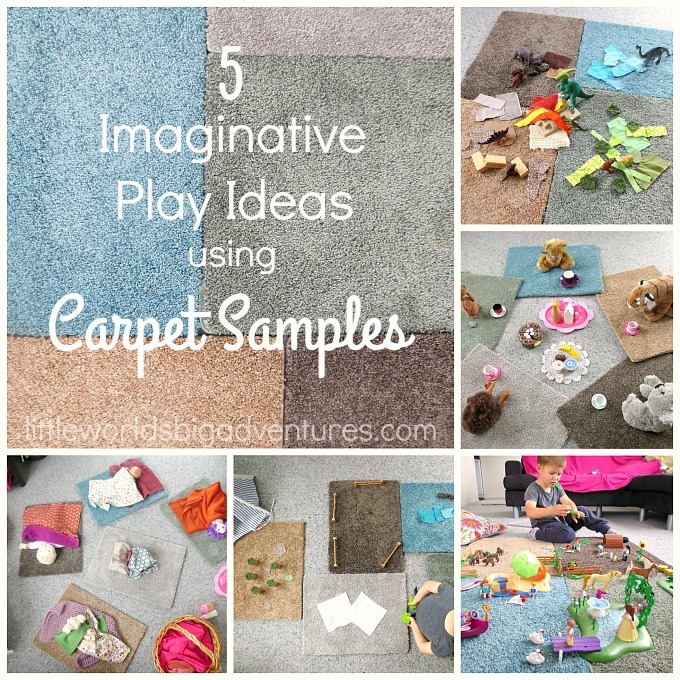 Imaginative play using carpet samples? Really? Why, yes!! In fact, it’s quite genius. They are lots of fun! And did I mention free? The play possibilities are endless here. Let me show you our 5 favourites. 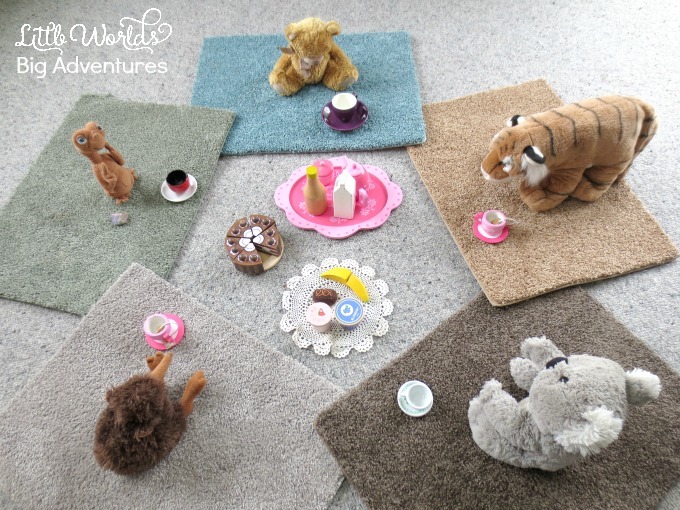 Not only can you use the little carpets to allocate seating at the tea party (your kids will just love this), you can also use one as a play stove (preparing your morning tea) or arrange all of them as a picnic blanket, the softest you’ll ever will know! This is when our carpet samples come out most: as play beds for the dolls. I can not tell you all the ways my kids use these mini carpets with their dolls. We’ve had nurseries, doctor’s offices, kindergartens, camping adventures, sleep overs, class rooms, emergency rooms, … You name it, they’ve played it. 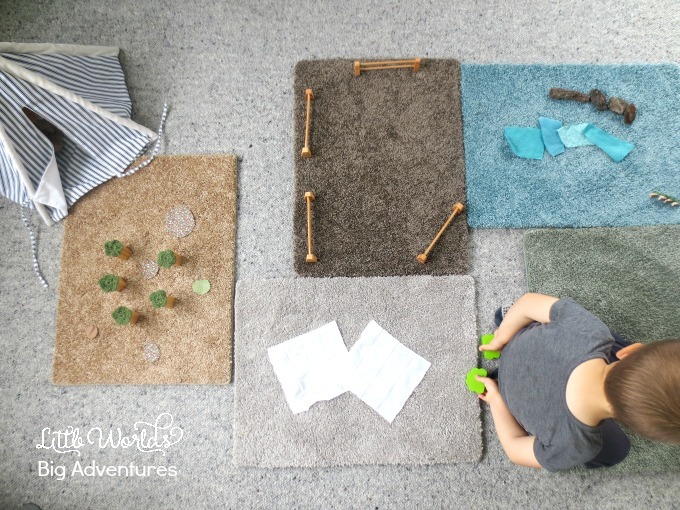 These carpet samples are perfectly suited for sensory small world play. The sensory aspect is right there: warm, soft fluff. The earthly tones (or whatever colours you end up with) set the scene for a multitude of small world play scenes. Since we’re in an all things dinosaur stage, I set up this little invitation to play for him to enjoy. 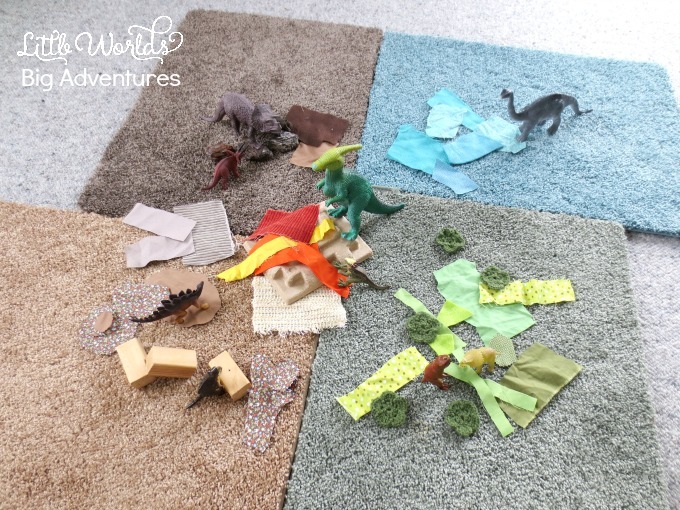 These mini carpets are the perfect play mats for getting your big collection of toys (Playmobil, LEGO, blocks, …) out and have a good long play with them. The carpets squares are soft and inviting and most of all: define the play space, so it doesn’t (read shouldn’t) end up all over the house. Plus, kids generally love it when they have a designated space where they can do their thing, it’s a win-win situation! 1. My son keeps falling asleep on them. He’s a highly sensitive boy and these little carpets really work well for him. He gets them out in almost every play situation and gets comfortable. Have a look here, where he used them in his blanket fort. 2. As briefly mentioned above: play mats define play spaces. And this is huge because it can radically change the way your child plays. Here is an interesting article about the importance of defining a play space. 3. Teaching children the importance of recycling. Most (all) carpet companies will gladly give you their last season’s carpet samples since they have to dispose of them anyway. This is a great opportunity to recycle and discover the joy of junk play. 4. And a great opportunity to show your children that the best things to play with often aren’t toys. 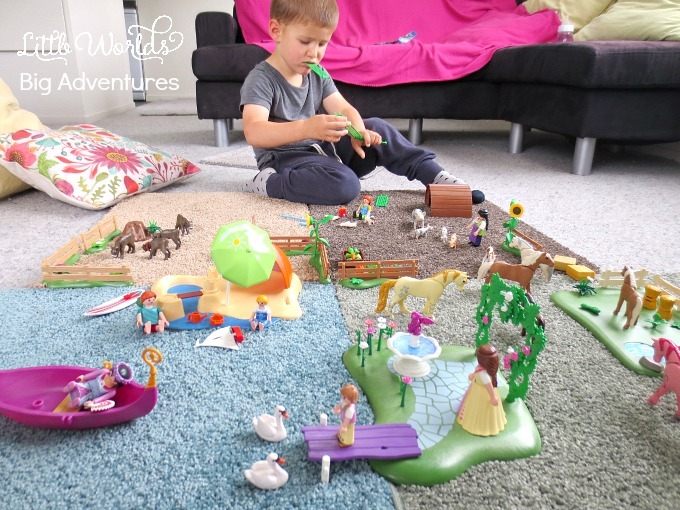 It teaches children to think outside of the box, to engage in imaginative play. I’m sure I’ve done my best by now to convince you that carpet samples are the next best thing and you should probably put a stack under the Christmas tree. Lol, that might not go down well! Anyway, be sure to give it a go! 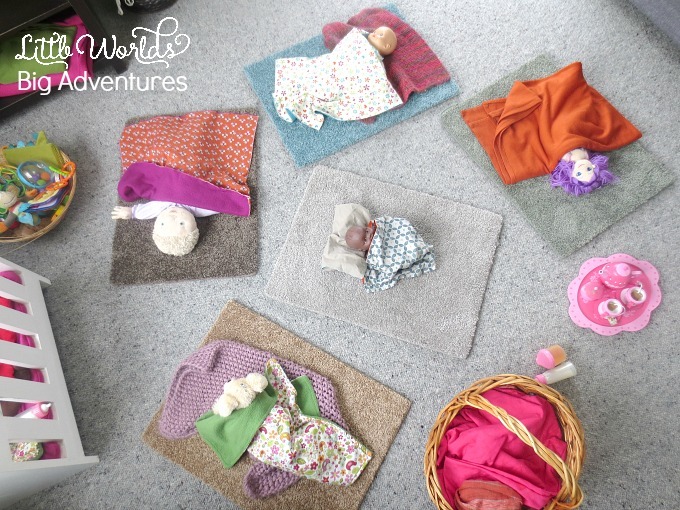 Hope you enjoyed this post and if you’d like to stick around for some more play inspiration, you might love to check out our dramatic play ideas or have a look at all the small worlds we’ve created.